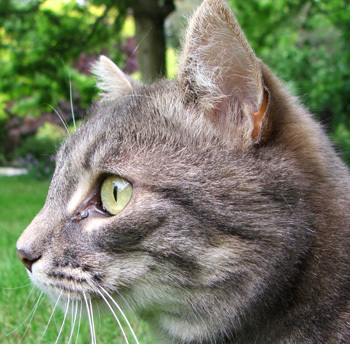 Jerome the grey cat spent her last years completely retired from active gardening life. All she did was sleep and purr. But my early writings are full of young Jerome being always in the garden. Old photographs of me always included her - my furry champagne-grey best friend, walking behind me or posing in the garden. I can't remember when she stopped coming outside. As one gardening cat retires there's always been another one (or two) to take its place. 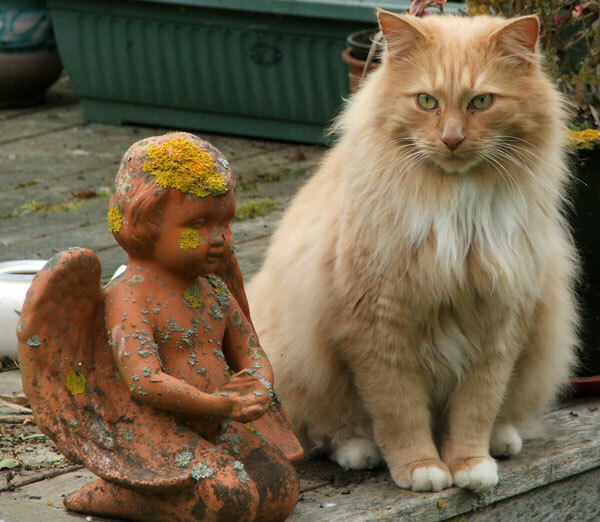 Now Fluff-Fluff (pale ginger) is my most co-operative gardening cat. 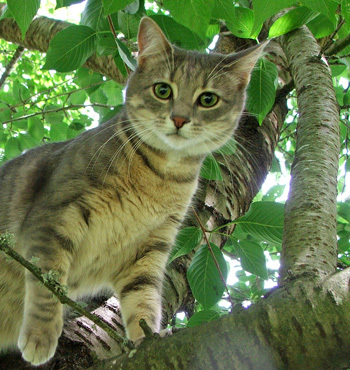 Cats choose their own spaces in the house and garden, but these, too, can change. Lilli-Puss is the latest to refresh her life. Called 'The Apprentice' grey cat, she used to share the upstairs bedroom with Jerome, and was destined to be Top Upstairs Cat when Jerome passed away. Enter little Minimus, also a grey, a little cat with big ideas. Timid Lilli-Puss was rudely chased away, out of the window. Now Lilli is the Stables cat - I feed her over there, and she's so much happier. She has the most loving, smoochy nature, so we two have rather pleasant, purry breakfasts together. Lilli has always been timid, so being chased around upstairs by little rodent-sized Minimus was just too much for her confidence. A new cat usually tweaks the feline equilibrium. Minimus, found wild in the woodshed, certainly did this when she joined the downstairs of the Moosey house. Percy and Fluff-Fluff were super-friendly, Histeria was rather horrible, and Tiger outrageously horrible. Overweight Tiger would spend hours hiding underneath chair covers, just waiting for the new kitten to walk innocently past. Fat bully! But other newcomers simply blend in, and nothing changes. 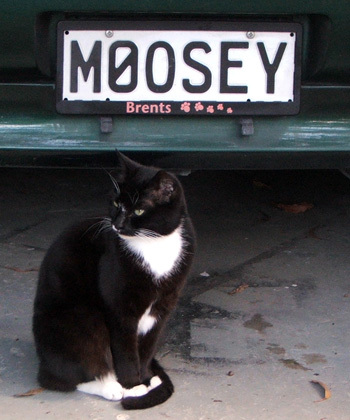 Kaya the latest Moosey cat, a young black female, is a most mellow and friendly cat. She lives mainly in the garage, doesn't bother any of the other cats, and oddly they don't bother her. She minds her own cat-business and potters happily about the house and the garden. Kaya cat doesn't feel the need to flex her claws and chase anycat out a window (Minimus - I'm talking about you). She's a mature, self-assured cat.